To Download these mp3 files, right-click on "PLAY" and choose "Save Link As..."
To Download this mp3 file, right-click on "PLAY" and choose "Save Link As..."
Last Saturday’s rousing “Guitars and Cadillacs” opening number from the onstage band may have been a bit too loud, but with the drums, 2 guitars, and keyboard at the ready, the solid “Family Tradition,” that followed had the audience well prepared for a country music main event: The HIGHWAYMEN Live at the Crighton Theatre. 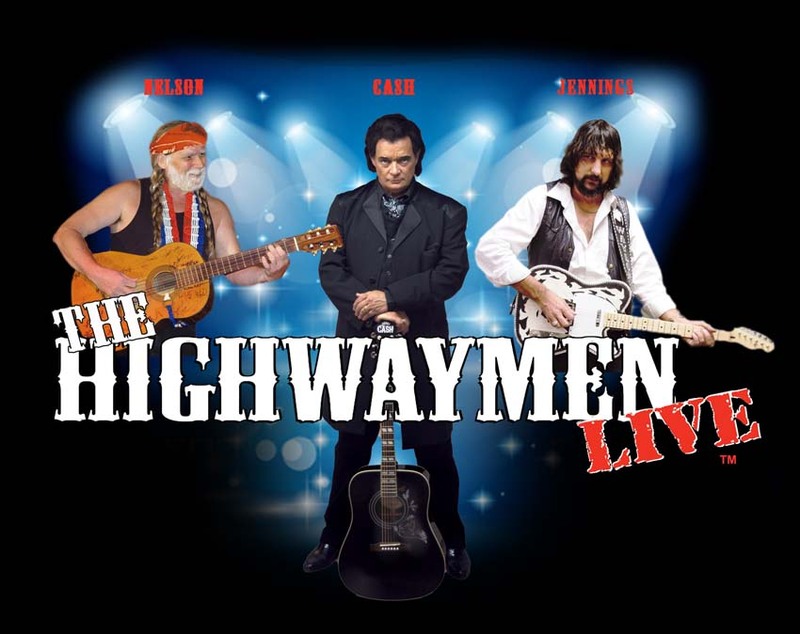 Billed as a 25th Anniversary tribute to the original country “Highwaymen” super group of recording artists that included legends, Kris Kristofferson, Waylon Jennings, Willie Nelson, and Johnny Cash. This edition featured brilliant performers representing the latter three so authentically, that you would swear the original stars were in the room. Michael Moore played Willie Nelson and his music with mystifying accuracy. The same was true of Phillip Bauer in his performance as Johnny Cash. No less stunning was August Manley’s performance as Waylon Jennings. If just one of these gents had gotten it so right it would have been worth the trip, but to see all three so completely embody these great legends was truly remarkable. With that authenticity in mind, allow me to use the names of the real legends as I describe the fine tribute program that followed. delivered a rousing “Whiskey River,” with still more impressive guitar work. But his “Blue Eyes Crying in the Rain,” lacked clear enunciation and was a bit disappointing. After Waylon offered, “Only Daddy That’ll Walk the Line,” Cash fired back in rich bass with “Ring of Fire,” and “Tennessee Stud.” There was a touching tribute to America’s military veterans, and those in the audience were asked to stand and be recognized. Then, on a lighter note, the boys joked about silly song titles they were working on like, “If I’d a Shot You When I Wanted, I’d Probably Be Out By Now.” The fun continued as they all joined Willie for a joyful, “On the Road Again,” and Waylon supplied the gentle roll of “Luckenbach, Texas.” Cash countered with a hand clappin’ “I Walk the Line,” and a tender Kristofferson composition, “Sunday Morning Coming Down,” was full of heartbreak and longing in its vision of “…disappearing dreams of yesterday.” Before the night was over he also sang an interesting tribute to the American Indian titled, “I Hear Drums.” Waylon came in for a landing with, “I Don’t Want to Get Over You,” and an, “I’ve Always Been Crazy,” that was full of piercing vocal power and stunning band solos on guitar, keyboard, drums and harmonica. Willie’s final numbers included, “Poncho & Lefty,” the classic, “For All the Girls I’ve Loved Before,” and a lovely rendition of one of the great love songs, “You Were Always On My Mind.” An orange glow surrounded the proscenium, and a happiness glow surrounded the audience as the boys wrapped things up with a “Good-Hearted Woman” that was really good. When I chatted with promoter, Larry Martin, outside the theatre, he told me as soon as he became aware of this “Highwaymen” tour, he was sure it would be the right fit for the Crighton. Amen to that! "How nice to see this duo (The Outlaws) back again. We saw them last July and were really taken by their performance. They ressemble so closely the originals in every way. They should be back more often since were sure their popularity would warrant it. We visit your area several times per year and always check to see who your featuring. It would be nice to see the Outlaws more. They are very entertaining.It would be really great if you could put your Johnny Cash with those guys--WOW-- what a show that would be. Anyway thanks for allowing us the opportunity to voice our opinion.Love your show.Sincerely"
"We were very pleased with the show this past Saturday nite. Best we've ever seen. We had heard about the outlaws from last year from friends of ours but had never seen them. For us they were the stars of the show though everyone was great. Their wit and ressemblance to the real thing was amazing. Though Waylon has passed its hard to tell by this show. Maybe he was in hiding. Love to see them more often. Waylon will never be dead as long as yours is around. And he and Willie are so personable and friendly. Thanks for a great time." "Thank you, thank you, thank you for bringing back those wonderful outlaws.They even seem better than before and we thought they were great then. We're sure Waylon has been resurected. Thanks again-just great." "What great performers. We were really surprised how well they performed and looked like the real thing. Spine-tingling to say the least. Hope to see them again. All in all a very entertaining show!" "Waylon simply left us both spellbound. It was as if we were seeing the real thing. He really must have studied his stuff. We are big Waylon fans, and he could have fooled us both. We have been at the theatre before, but that show was a really pleasant surprise. Please try to have them back. There are so many people who I'm sure want to see that act. Thank you!" "We think we have seen as good a show as Nashville has to offer. I don't know where you "dug" Waylon up, but I'm sure it was him in the flesh that we saw at the show. We could not believe it. Willie and Johnny Cash were also great! These guys are truly a remarkable act and should definitely be on the big stage. Just great!"